Does the Sagittarius Stream constrain the Milky Way halo to be triaxial? I am still well behind on posting papers that were accepted at the end of last year, so a brief post to help clear the backlog. Brevity is also forced upon me as it is grant writing time, and as well as writing a grant, I am mentoring others. Today's paper was accepted in December, but it is based on work I've been involved with for more than 15 years. The lead author is my old colleague, Rodrigo Ibata, who you've met before, and the subject matter should be familiar, namely the Sagittarius Dwarf Galaxy. Just what is "The Big Bang"? Notice that I didn't title this post "Just what was The Big Bang?". I know I've written about this before, but there is this misconception that the Big Bang, the cosmological not the tv show, is something that happened in the deep distant past of the Universe. This leads to no end of arguments about the creation of the Universe, the mystery of what came "before", and the question of a creator (tip of the hat to the nice young man from the Church of Latter Day Saints who had a 10 minute chat with me at the train station first thing yesterday morning). So, I am here to teach you what the Big Bang *is*. You may think that this might make this an extremely long post, with lots of jargon, equations, difficult concepts and bizzarre grants. Well, Dear Reader, it won't. You won't have time to even make a cup of tea. I haven't posted anything about the bushfires up in the Warrumbungle National Park, especially those that tore through Siding Spring Observatory, my old workplace. Part of the reason was that I was too stunned - I was chatting about this on a skype call this morning, talking about the tidal streams of the Sagittarius Dwarf Galaxy, and remembering that it was discovered at the Anglo-Australian Telescope. It was 46C in Sydney today, and living on the edge of the bush, the thoughts of fires tearing through the suburbs is very scary. Anyway, a fellow welsh person visited the observatory today. 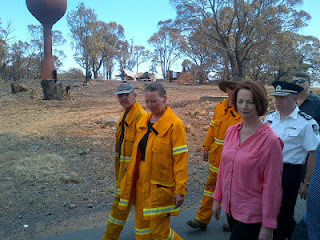 (pinched from Amanda Bauer's blog) Prime Minister Julia Gillard was born in Barry, not far from where my brother lives. But just behind her in this picture is the AAO Director's Cottage, a place where I have slept a few times after very long nights observing with the scary 2dF instrument, and instrument whose robot tried to attack me more than the one in Saturn 3. A quick post today to follow-up my previous Andromeda post. I've published an article in The Conversation titled Cosmic dance challenges our understanding of the universe which describes the result. I've covered most of this in the previous post, but a slightly different spin. Enjoy. As promised, here's a post about our recent Nature paper. I think the title of the paper basically says it all, although this is a the result of a very large amount of work. It also turns out that I am writing some articles on this for public consumption, which I will also post here, so here's the summary version. 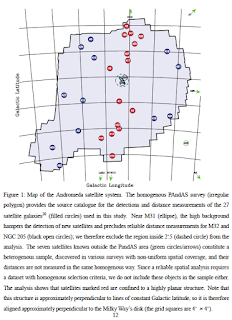 I written previously, here and here, about the sterling work by PhD student, Anthony Conn, on measuring the distances to the almost 30 dwarf galaxies in Andromeda, as part of the PAndAS program. The first week of 2013 has come to a close, and it has been quite a week, with an accepted cosmological paper, a Nature paper appearing (which will be blogged about before the weekend is through), and another achievement of which I am proud. It's all to do with this place. Some of you may recognise this as the summit of Mount Kosciuszko, the tallest mountain in Australia, and hence the highest mountain on the continent. I climbed this with the family on Sunday under an extremely toasty Australian Sun and, as we didn't take the easy way back, but followed the far more up-and-downy Main Range loop, and so covered 22km, and were left with sore legs, and a golden brown colour. Phantom Energy and the Cosmic Horizon: Rh is still not a horizon! Back to work, and a good start to the New Year. 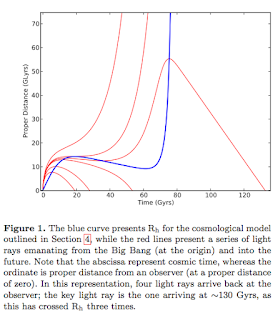 I will write more on this shortly, but our paper in Nature was published yesterday (the various astronomical societies I spoke to last year know about this result, but I've kept it quiet in professional circles - hopefully it will cause a few wave). I know I keep saying it, but time is squeezed so a brief post today. And that's on another paper that I had accepted yesterday (I am still trying to catch up on the Christmas list... Ah well, I will get to those eventually). I've written before about the work I have done on "The Cosmic Horizon". It's a long story, but there have been claims that this is a magical part of the Universe which has not been properly understood and modern cosmology has it all wrong etc. Simply put, these claims are wrong, but they keep appearing. So, this new paper was in response to another paper which claimed our previous paper was wrong. As ever, the claims are wrong, as I describe.